The Great Wall is Not. Matt Damon stars as William, a heroic criminal who becomes a hero (that was intentional). William and his cohort, Tovar (Pedro Pascal), are forced to surrender themselves to the Nameless Ones, an army sworn to protect the Great Wall, which is a fairly big wall in China. There, they are drawn into the middle of some kind of struggle between the Chinese and the Tao Tei, a race of Giger-esque monsters that want to eat everything. Luckily, the Nameless Ones, led by Commander Lin and Strategist Wang (that’s literally a character’s name) are there to lead the charge against the onslaught of these foul beasts. That’s pretty much The Great Wall. It’s not complex at all. This movie is not interested in character at all. Or bonding. Or really showing anything except how epic everything is. 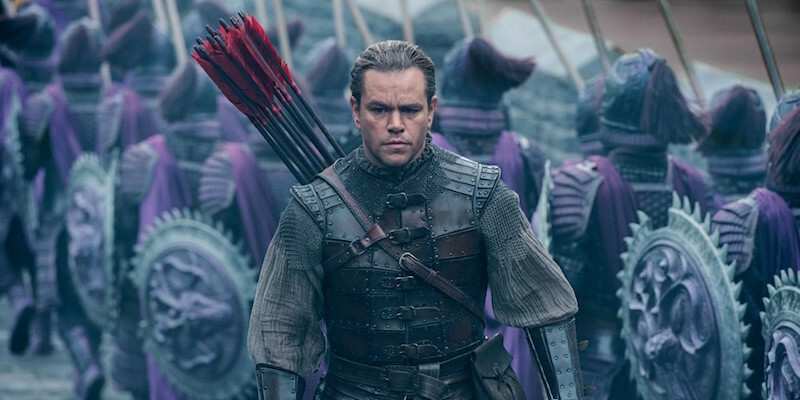 The Great Wall manages to wrangle a bunch of extras in beautiful, brightly colored armor. There are lovely vistas to behold and a couple neat tricks here and there. Despite the epic epic-ness, the film moves along at such a brisk pace that I wanted to gouge my brain out. I didn’t care about anything because I didn’t know who anyone was and what people were doing at all. I was frustrated beyond belief and left with a sinking feeling that nothing in this film matters and nothing in life matters. At some point, the Nameless Ones coat spears in some sort of yellow substance so they can capture one of the Tao Tei to test a magnet rock and see if they can control the beasts. It wasn’t until 5 minutes into the scene that I figured out the yellow substance was sleeping potion. Also, there’s a magnet rock that controls these monsters because…reasons. I can forgive weird MacGuffins. The Avengers big planet killing weapon was a light cube, so magnet rocks are not out of the realm of the believable for me. Even though it’s a magnet rock, which seems silly, especially since the magnetic part of the magnet rock seems to come and go. Whatever, I’ll go with it. What I can’t take is just not slowing down to show me why I should care for Scottish Matt Damon and the Nameless Ones. The Great Wall is interested in showing the might of the Chinese Army over any semblance of a good narrative. The Great Wall was originally released in China. I’m eager to see if there were any differences between the Chinese version and the American because the Nameless Ones do a lot and Matt Damon does…not as much. There is a scene where William and Tovar just look at the Army and how great they are. That’s the scene. I couldn’t help but remember the first American version of Godzilla. Raymond Burr plays a reporter who observes the Japanese trying to deal with the onslaught of Godzilla. The Japanese eventually invent a weapon that will zap all the oxygen out of the water. As the Japanese triumph over the tyrannical lizard, Raymond Burr is…there. Matt Damon and Pedro Pascal (who have great chemistry, by the way) feel like they are glomped onto a lot of scenes. Sure, Matt Damon helps save the day, but he literally helps set up another character to do it. It avoids the White Savior trope slightly, but it makes me wonder why else should this character be here besides, you know, needing Matt Damon to sell this movie. William has no arc. He starts off as a heroic archer/soldier and ends as a heroic archer/soldier. He kind of trusts strangers now, I guess? It’s remarkably flat and any positive points of William are just by sheer force of will by Matt Damon. The Great Wall doesn’t even do you the favor of being a catastrophe. The film has a lot of moments that made me tilt my head much the same way my roommate’s cat does when he hears me scratch the bed. The production values are too good and the CGI is too bad to make this even an enjoyable hate watch. What makes this an even more frustrating watch is seeing The Great Wall of China as a weird mystery box thing. The Great Wall in The Great Wall has secret chambers, hidden weapons, and more. The Great Wall literally has a 5-pronged attachment to help a group of all-women soldiers (The Crane Corps) fight the Tao Tei whack-a-mole style. Also, apparently the Great Wall can split open and have helicopter blades stick out to help decapitate monsters. The end set piece takes place on ancient hot-air balloons that are exploding left and right because of how dangerous they are. Ancient hot-air balloons. These kinds of creative liberties are the gonzo ideas that would have helped elevate The Great Wall into something special. As it is, The Great Wall revels too much in conventional set pieces to be anything great. There are 400 slow motion shots of the Tao Tei getting stabbed by a spear in the mouth. It gets old fast. Stay at home and cherish your family instead of seeing The Great Wall. Also, Willem Dafoe is in this movie. This film was watched at a sneak preview screening at the Regal Gateway in Austin, TX on Wednesday, February 15 at 7:30 P.M.